Nathalie and Francois are happy to welcome you to their normandy home located on the hills above Honfleur, in the countryside just minutes away of the old port. Set in a pleasant ... Read more... surrounding, this former 18th century cider mill has been refurbished in a superb traditional manor house. There are 3 charming bedrooms on the ground floor as well as 2 lovely en suites on the first floor suitable for family. All bedrooms have a traditional character and are furnished with antiques. En suite with bath or shower, and private toilets. The Hortensia lounge is at your disposal for your relaxation around the fireplace. The mouth-watering delicious breakfast will be served according to the seasons in the lounge or on the terrace. Secure parking. Rooms Gîtes de France 4 épis. Sophie and Jean-Louis will welcome you in one of the Villas (in restoration) which made Honfleur's History. Built in about 1850, this property is now in the progress of being restored respecting ... Read more... its history. Five bedrooms are available, all equipped with bathroom and private WC. Those bedrooms can accommodate between 1 and 5 persons. (Family room) The original materials give to each room nobleness and authenticity. The refined décor of the place lavish you in a harmonious atmosphere. Appreciably comfortable, each bedroom is neatly furnished , each bathroom is spacious and clear. A private car park allow you to be parked in total safety. The proximity of the town centre (5 minutes walking) offers you the luxury of using and overusing of art galeries and historical areas of the old Honfleur. Breakfast are served in the guest dining room, jams share the limemlight with cakes cooked every day for you. Ideally situated in rural Normandy just 10km from Honfleur, this magnificient property is an authentic half timbered country house. The grounds have shady apple trees and with grazing horses nearby it is ... Read more... an idyllic retreat that offers complete relaxation. Rooms are tastefully decorated in pastels colours.The devoted hostess takes care of her guests very seriously, ensuring excellent hospitality. The breakfasts, served in the living room with a view of the flower filled garden, gives guests the best possible start to their day. Tea, and coffee making facilities available. Independent access. Private parking. Near to hiking routes. Beautiful house in Normandy, located 4km from Deauville-Trouville, heated swimming pool 12m X 6m, large fireplace, 4 guest rooms with bath or shower, wc, flat screen TV, , parking. In an old priory , parts from the 17 th century, . In the dependency, 2 bedrooms for 2 persons, and a suite until 5 persons. The house is close to ... Read more... Deauville, Trouville and Honfleur, in the center of "Le Pays d'Auge". Guest house in a beautiful Anglo-Norman 30s villa with materials and furniture from that period. The rooms are tastefully decorated and are declined on a different theme for each. They feature ... Read more... all modern amenities and are designed to accommodate comfortably two adults. A trailer full of charm takes place in the garden and awaits you for an unforgettable bohemian stay (Suite rate). The property has an enclosed garden with garden furniture. Secure access with electric gate parking. We are located 800 meters from the village of Pont l’Évêque where you will find a dozen restaurants. The towns of Honfleur, Deauville and Trouville are within 15 minutes drive. Lake activities, hiking trails, race track, horse riding and golf nearby. In an old barn, parallel to the main house, 3 independent cottages, enjoying a private terrace, have been rehabilitated. The breakfast, tidy, is made in the press, on the veranda, or on ... Read more... the terrace which enjoys stunning views. The restoration is character thatched, cob, lime wash... You will find the charm of the old with the modern comforts because everything is new! Attention to detail, exclusive interiors spaces or guests' privacy is protected. Everything has been chosen for your pleasure and comfort with quality materials. Our Guesthouse, half-timbered house, with heated indoor pool is located in the heart of stud, 9 km from Deauville. Our rooms are spacious and very comfortable. Each room is equipped with ... Read more... a bathroom, a separate toilet, a sitting area with flat screen TV. Beautiful swimming pool inside of 11m X 5m. 4000m2 wooded park. 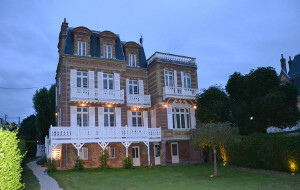 A few kilometers from Deauville, Cabourg or Honfleur, forget everything, during a night. In each room, massive beds of 180, large pillows and antiquefifties found here and there which seems ... Read more... to have been designed only for les Parcs Fontaines. In the bathrooms, cozy white bathrobes await you. be lazy in our spa ( hammam, massage) .